Kleresca® is an efficient treatment for all kinds of acne vulgaris, even severe cases. To start the treatment, you should schedule a consultation. A dermatologist or clinician will determine whether treatment with Kleresca® is right for you. A healthcare professional will cleanse your skin and apply the Kleresca® gel to your face. The gel is then photo-activated using a multi-wavelength LED lamp. In clinical trials, Kleresca® showed high efficacy on people with moderate to severe acne. Nine out of 10 people saw an improvement to their skin*, whereas every third person achieved clear or almost clear skin. Kleresca® Skin Rejuvenation is a non-invasive biophotonic treatment designed to rejuvenate your skin with high safety and efficacy and with little to no downtime. Inspired by photosynthesis, the scientifically documented technology stimulates your skin’s own biological processes to improve your complexion and overall skin quality. Studies show Kleresca® leads to an approximate 400% increase in collagen build-up*. The innovation of the Kleresca® Skin Rejuvenation technology lies in its ability to create fluorescent light energy that activates your skin’s collagen-producing cells. The fluorescent light energy penetrates the skin and reaches into multiple layers, boosting collagen production by stimulating the natural processes of the skin. 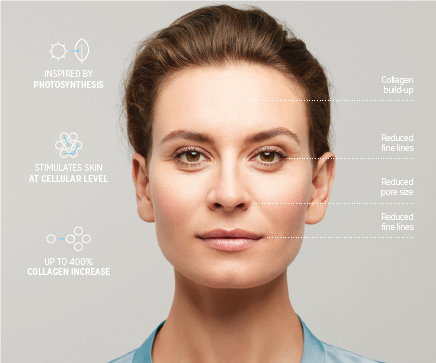 Studies show Kleresca® Skin Rejuvenation induces an approximate 400% increase in collagen production*. Kleresca® Skin Rejuvenation has a high safety profile and requires little to no downtime. Side effects – seen in some patients – are all non-permanent and may include redness, swelling and hyperpigmentation (bronzing of an area of the skin). Side effects impact patients differently – if at all – so we always recommend talking to your clinician before beginning treatment. Combined, these enhancements add up to an overall improvement in skin quality that patients typically describe as a feeling of radiance. Furthermore, Kleresca® Skin Rejuvenation has been shown to continue improving the skin quality even after the course of treatments has been completed. Kleresca® Skin Rejuvenation has shown effect as a facial treatment and is also being used on the neck, décolletage and hands. 1) The skin is cleaned and Kleresca® Skin Rejuvenation is applied. 2) The gel is illuminated for nine minutes using the multi-LED Kleresca® lamp, together creating fluorescent light energy that stimulates the skin. 3) The gel is removed and the skin is cleaned and moisturised. Some patients have reported an immediate effect after one treatment. What’s more, improvements will continue even after the course of treatments has been completed.